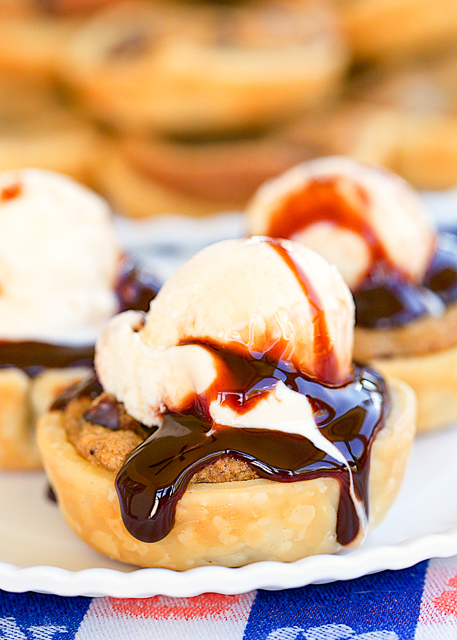 Deep Dish Chocolate Chip Cookie Pies - only 2 ingredients!! SO easy and SOOOO delicious! Top with ice cream and chocolate sauce to put these over the top. Great for parties and cookie swaps! Need a stupid simple dessert that tastes great?!?! 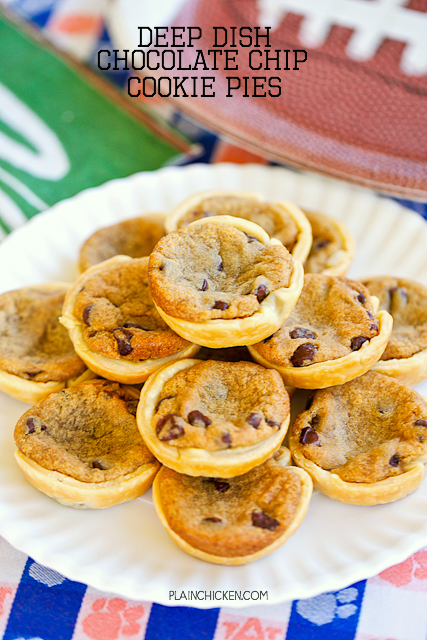 Well, look no further than these Deep Dish Cookie Pies. They only have two ingredients! TWO! WooHoo!! These easy to make and even easier to eat. We ate way too many of these! They are especially delicious topped with ice cream and chocolate sauce. YUM! These will keep for a couple of days in an airtight container. Our batch didn't last too long, so you might want to double the recipe if you are having these for a party or tailgate. Preheat oven to 375 degrees. Lightly spray 2 regular muffin pans with cooking spray. Set aside. Unroll refrigerated pie crust. Using a 3-inch round cookie cutter, cut 12 circles from each pie crust. You will need to re-roll the scraps to get the full 12 from each crust. Place each 3-inch pie crust in the muffin pan well. Place 1 piece of refrigerated cookie dough in each pie crust. Bake for 15 to 18 minutes, until crust is golden brown. Store for up to 2 days in an airtight container. These look sooo good - thanks!